The Church sits about 25 yards away from the street, tucked between a red-bricked restaurant and a drab, multi-level parking garage. It seems a common sight: a sacred space hidden away. At the end of the path, weathered sandstone rises into the air reaching towards a gabled entryway with an octagonal bellcote set to the side. A raised terrace spans the length of the walkway, inviting you to sit in the sun among the lattice, vines, and flowers. 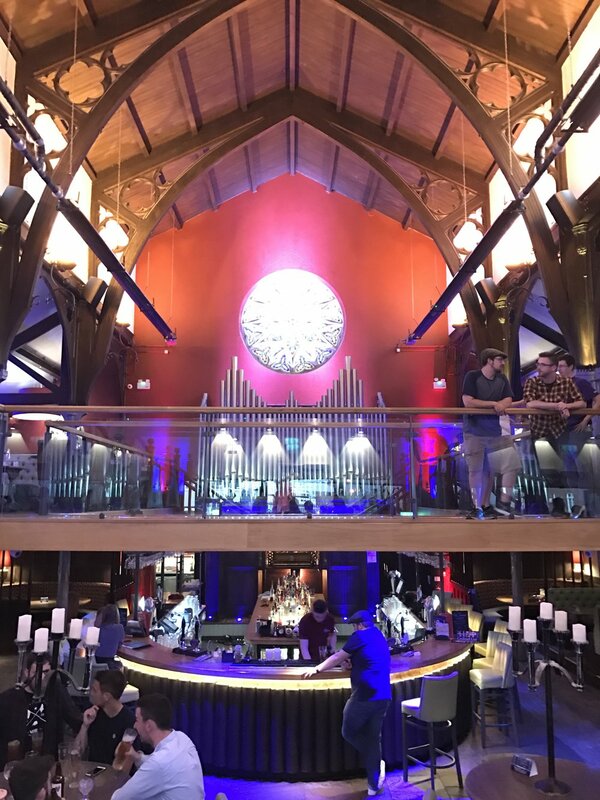 Upon entering the building, your eyes are immediately drawn to the organ pipes and rose window against the dark red wall on the west end of the room. Then you see the horseshoe-shaped bar, with its rainbow of bottles and lights, tended by young servers dressed in black — like clergy without collars. There is a mezzanine level for dining that overlooks the bar area and the mezzanine is connected from the north end to the south end by a sleek, glass and wood bridge. Indistinct music plays, neither tuneful nor rhythmic. The kind of music that is intended to lull you into believing you’re cooler than you really are. I like iconoclastic people and places. Naturally, The Church appealed to me. Built in the middle of the 19th century in Cheshire, England, St. Andrews was a Presbyterian church before becoming unused in 2005. Eight years later it opened as a restaurant and bar. The Glee Club visited The Church in 2018 after a two week performance tour of Ireland and Wales, and after a day of walking through the half-timbered streets of Chester. The next day we were returning to Iowa and The Church was hosting us for our final banquet. We filled the entire mezzanine, though the guys spent as much time down near the bar as they did in front of their plates. I spent the first 30 years of my life believing that I would be making music as a professional church musician. When I was 12 I began playing regularly for Primera Iglesia Bautista in Buckeye, Arizona. I would get into the family van with my sister and parents, ride to our home church, and attend about 10 minutes of Sunday School before I would walk away and head towards Highway 85, which after a dusty mile would take me to my gig. I spoke no Spanish, so the services bored me. My parents purchased a bilingual bible to help make the hour more interesting, but I didn’t have the discipline to use it to my advantage. I took to raiding my father’s library on Sunday mornings and began regularly carrying Nietchze’s Beyond Good and Evil, along with a Spanish bible and hymnal, down the desert highway to play gospel songs on an old piano in a little stucco church. For the next 18 years, I was a professional church musician and I am grateful for those years. There were lessons learned, skills developed, and experiences lived that have continued to educate me long after leaving particular congregations. Yet in each church, and in each congregation, I felt a little like those early days at Primera Iglesia — feeling pulled apart by divergent ideas, not understanding the language, yet still showing up no matter how far the walk. And the music itself — too often the music seemed indistinct, intended to make me believe I’m cooler than I really was. As a result, I was an unhappy church musician. The work would toss me about from distress to anger to despondency. My wife eventually told me that she didn’t want to live with me if I continued working in churches. So I left the dusty road that leads to my church gig. I am still moved by church music, however. The Presbyterian church I regularly attend will sometimes sing hymns that sweep me away into hope and sentiment. I also believe music, more than anything other than silence, can lead us to that which is important. And I often wish I could have been a good and happy church musician. That night at The Church I sat close to the organ pipes, with my back to most of the guys. I liked listening to the cacophony of laughter and storytelling, but watching them all continuously descend from the mezzanine towards the bar for drinks didn’t seem like fun. I sat privately with my graduate student, who upon graduation was becoming more friend than student, and listened contently to the loud guffaws, clicks of utensils against plate, and clinks of glass as toast after toast was made throughout the room. Over the past two weeks the Glee Club had had a great adventure together, performed triumphant concerts, saw the fierceness of nature, and walked in new places with a confidence that you only see in the young or the foolish. After dessert it was time for me to say something. I walked onto the bridge that connected the mezzanine and the guys fell silent. Other patrons, at tables on the main floor, looked up curiously. I could feel the divergent energies of happy expectancy from the Glee Club, and wariness from the other patrons. I don’t recall what I said. But I remember striking my tuning fork, giving the guys a pitch, and conducting “Brothers, Sing On” from the mezzanine bridge. The Glee Club spread across the mezzanine, trapping The Church in their community of song. The song was distinctly theirs, informed by hours upon hours of rehearsal, financial sacrifice, shared laughter and struggles, and mingled with gratefulness for the past and anxiety for the future. It was a song some had been singing throughout college, knew by heart, and sung now with the strain of knowing they were singing it the last time. And it was a song younger members had practiced for a year, but were just now learning how to really sing. And there I was, in the middle, looking West towards the rose window and the organ, finally realizing that I was making church music. As the Glee Club tends to do, they owned the room. The patrons below were gobsmacked, coming up to me afterwards with free drinks expressing their disbelief. One young woman told me that she didn’t know that choirs “like that” even existed anymore. This woman had walked into a church turned inside out and was surprised when a group of joyfully buzzed 20 year olds resurrected a sacred space. I think what caught the patrons attention was the sound of the music itself. And I think what surprised the patrons was the setting. But what moved them was the secret knowledge that the music represented the journey the Glee Club had taken to get to The Church that evening. Just like I think Primera Iglesia Bautista appreciated my walk down Highway 85 more than my piano skills. But I have found myself returning to the sounds of their voices. Remembering how after a few seconds the bartenders turned down the stereo system so everyone could hear the guys sing. And I remember luxuriating in the realization that because I was surrounded by singers, I could stop conducting and focus on the western wall — its organ and rose window. It’s as if I turned around that night and saw myself walking into a little stucco church with Nietzsche. I don’t know what any of this means for me or my music yet. For now I’ll have to be content to simply keep it as a sacred space hidden away.